Solar panels are a practical way for businesses and homeowners to go green. In fact, this clean energy resource benefits the environment, but if it’s not installed properly it can put you a little too close to nature. Imagine the same raindrops that fall against your windows are leaking from your roof and dripping onto your face. Complications from a poorly installed solar system can leave your roof with structural harm and your building with water damage. Trust the experts to protect your investment and your roof, so you can relax and enjoy your new solar energy system. A majority of solar panel installations are located on the roof of homes and businesses across the country. Before your solar panels can be installed, the crew will evaluate your roof. They will look at the slope, and map where drains are placed and evaluate other potential obstructions. Mounting your solar panels on the roof correctly is one of the most important steps in the installation process. If your solar panel installation is not correct, it can cause roof damage, leaks and future problems with your solar system. The panels are pretty lightweight, so they can easily blow away and break. During installation, they’re secured with heavy weights from cinder blocks. After construction has finished, the panels will be securely attached to your roof. First, the structural attachment pieces of solar panels are installed just below the roof for even weight distribution and more protection against damage from high winds. 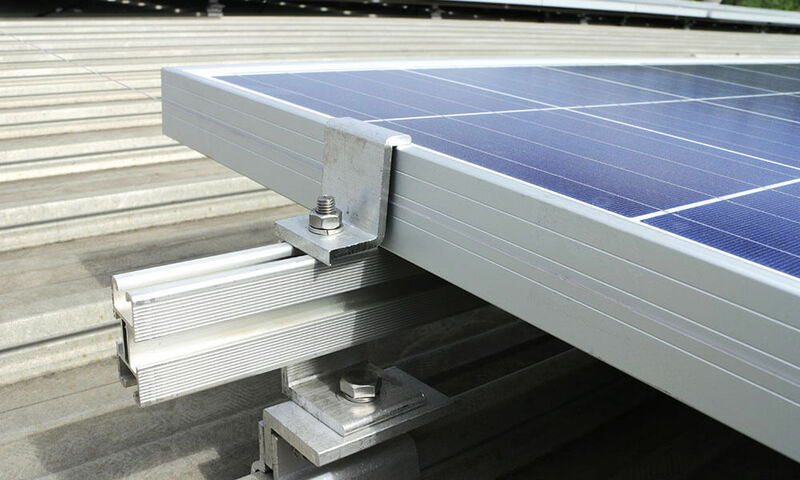 Most solar panels are secured to rafters or other structural parts of your roof with a stanchion mount. Stanchion mounts are upright fixtures that are sturdy enough to support the weight of solar panels. In addition, the solar panel attachments are flashed to prevent water from leaking into your home. Flashing on a roof uses metal pieces to divert water and prevent it from pooling. In addition to flashing, the roof attachments are sealed for further waterproofing. Metal roofs present additional challenges for solar system installation. Compared to traditional asphalt shingles, metal shingles are more difficult to install solar panels on, which means the process is usually more expensive. Sometimes the metal shingles have to be completely removed before the solar panels can be installed. Installation options with zero roof penetration are available for solar systems located on a metal roof. Metal roofs combined with thin-film PV solar laminates are one option to install solar panel roofing without penetrating your roof. When installing solar panel systems on a metal roof, use the right clamps. Ill-fitting clamps can bend the roofing seam and void your warranty. Matching your roof lifespan to the lifespan of your solar energy system will help you avoid problems. An array of solar panels can last over 20 years, but that won’t matter if your roof fails during that time. Aging roofs will not have the structural integrity necessary to support a solar panel system. If your roof deteriorates beneath your solar panels it can lead to water and structural damage in your home. Not only will your roof have to support the weight of your solar panel system, but it will also have the added stress of the installation crew and equipment. Debris from the construction can clog water drains, dropped tools can penetrate the roof membrane and other construction wear and tear can cause expensive damage to your roof. Solar panel systems have helped businesses and homeowners reduce their carbon footprint and rely more on clean energy resources. Proper solar panel installation is fundamental to protect your building from structure or water damage. Let the sun’s rays energize your home, but trust the professionals to make sure your roof is protected from nature’s other elements.